The Squire’s Landing has anchored in Australia’s most sought after location. 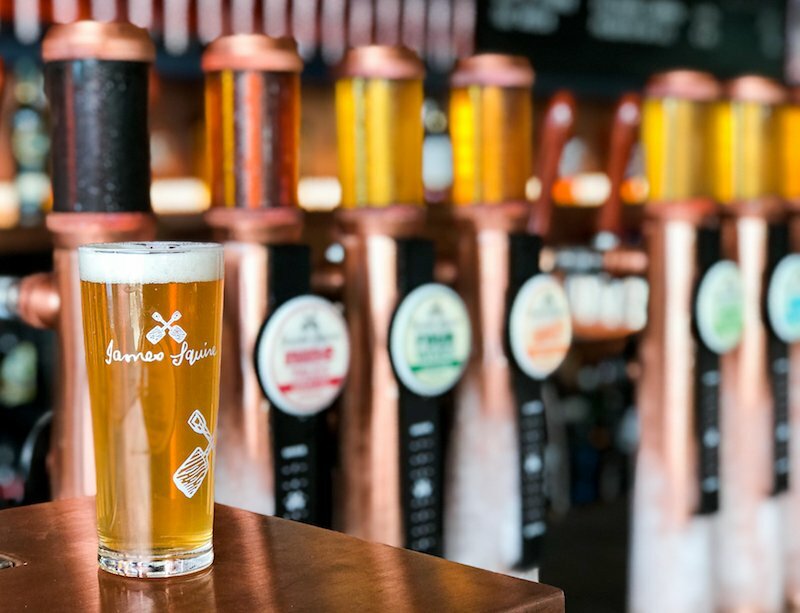 With a 180-degree view taking in the Harbour Bridge and the Opera House, James Squire’s premiere brewhouse has reimagined the Overseas Passenger Terminal. 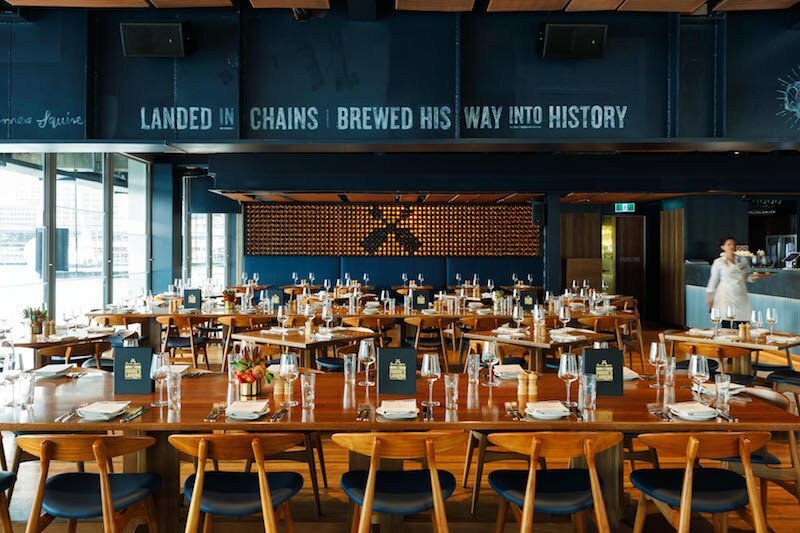 Almost 230 years after the venues namesake, then-convict James Squire, arrived in Australia, the glamorous two storey building pays homage to the brewery and Australian produce. Downstairs, revel in the publican familiarity of the Brewhouse. Offering the traditional beers, burger and pub grub affair, the Brewhouse menu is ideal for a casual catch up over a schooner and a game of footy. Head to Sydney’s most luxurious beer garden for a drink under the shade of the Harbour Bridge. However, it is upstairs at The Squire’s Landing restaurant where the venue sets sail. With glistening timber floorboards and subdued lighting, the dining room emits a rustic decadence. Despite being separated by a glass window, walking inside you are immediately greeted by the aromatic sensations of the seasonal menu and a suckling, rotating pig. If you can, reserve a seat in the secluded dome dining room. Separated from the main space, the wall to ceiling glass room pairs a money can’t buy view with a unique menu. For the James Squire’s aficionados, The Squire’s Landing is understandably the place to bathe in brewed goodness from the core range. A tasting paddle is a great way to honour Mr Squire. The venue also houses its own microbrewery. The craft beer selection offers a suite of constantly changing craft beers. If beer isn’t to your liking, the upstairs venue also has an impressive curation of internationally sourced wines and champagnes tailored to suit any diner. An array of classic cocktails are also available. 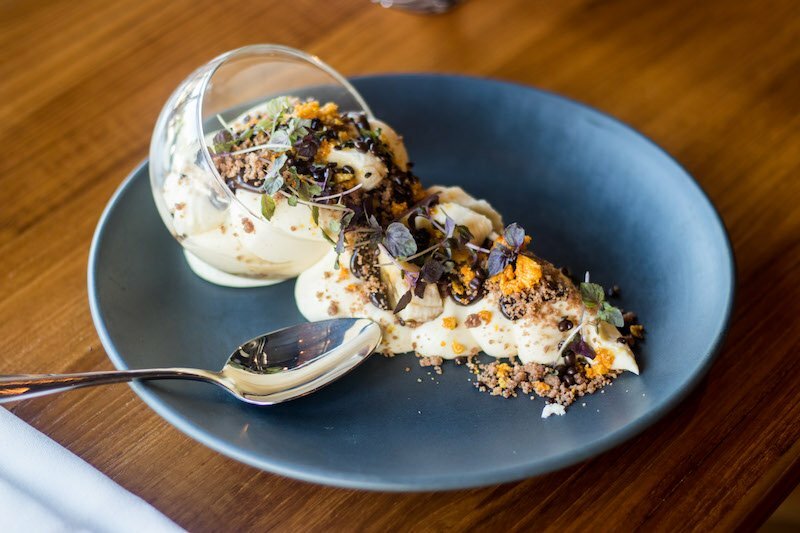 The Squire’s Landing’s appreciation of beer sceptics is an interesting, yet necessary realisation as it helps create a refined dining experience, contrasting that of the Brewhouse downstairs. The restaurant at The Squire’s Landing is predominately focused on crafting a unique, high-end pub experience; one where diners pay a premium for the sensational visual atmosphere. For our visit, we begin with the most un-publike dish on the lunch and dinner menu: the Hiramasa kingfish ceviche ($25). Shared as a starter, the dish is a refreshing palate cleanser, albeit a little underwhelming. 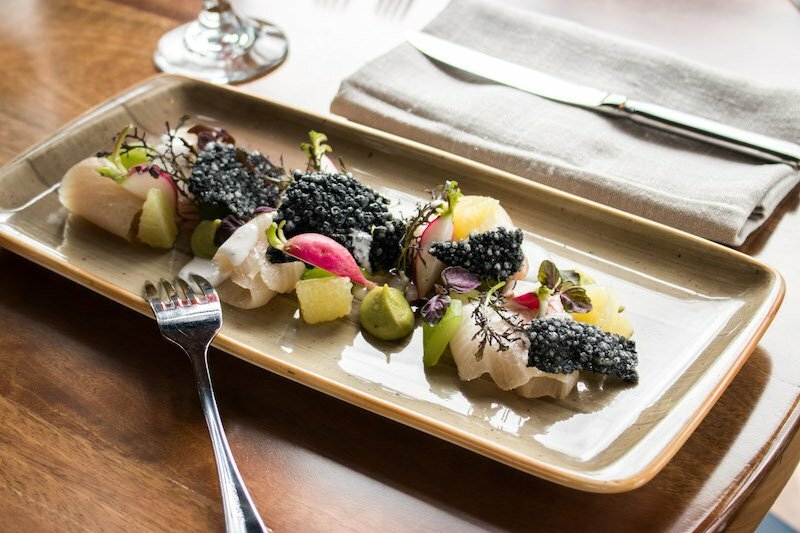 The Kingfish works well with the avocado puree and crunchy charcoal bark, however the pieces of cucumber are unnecessary. Also to share we have Hervey Bay scallops and snapper crab ($26). 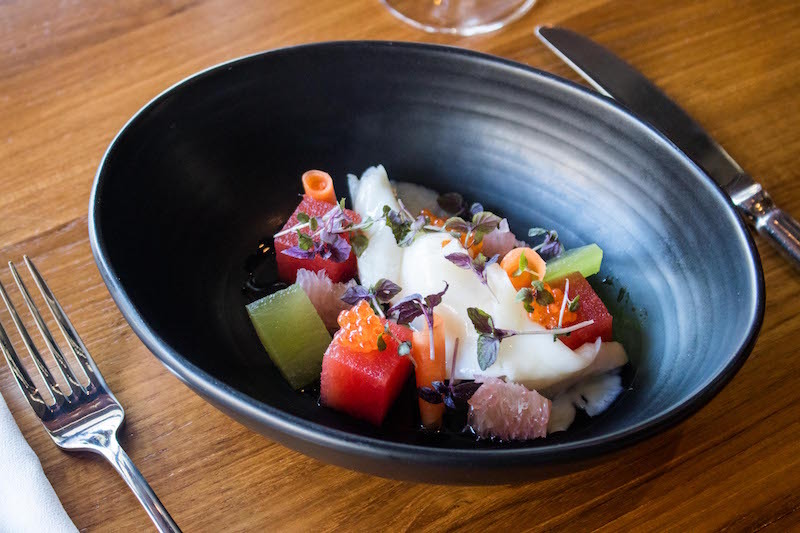 A subtle mojito dressing and pickled vegetables offer a pleasing acidity to the creamy ball of snapper crab draped beneath. Moving to large dishes, The Squire’s Landing once again proves that they are no pub grub institution with a 21st Century selection designed to appease any diet. 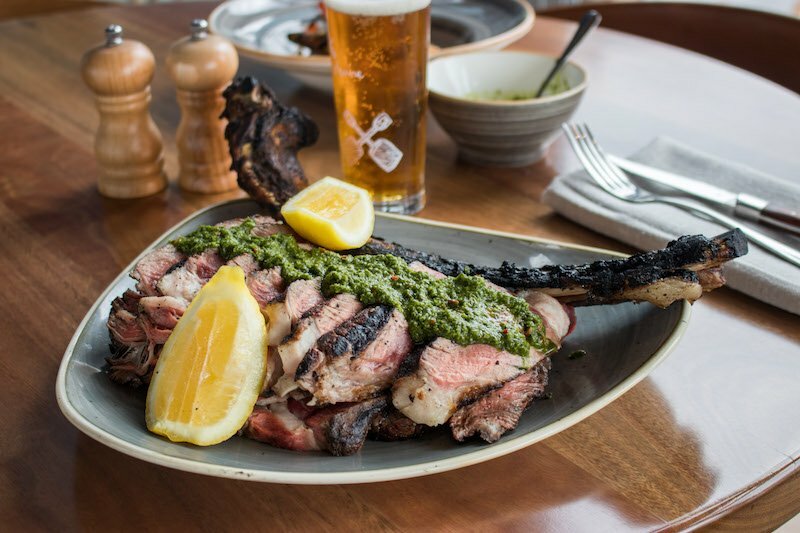 Taken from The Butcher’s Block Wood Fired selection, the Tomahawk Steak ($135) is the piece de résistance. At a pleasantly overwhelming 1.4kg, the steak is delightfully tender and finished with an energetic chimichurri sauce and lemon squeeze. More affordable, yet similarly simple meat dishes are also available. 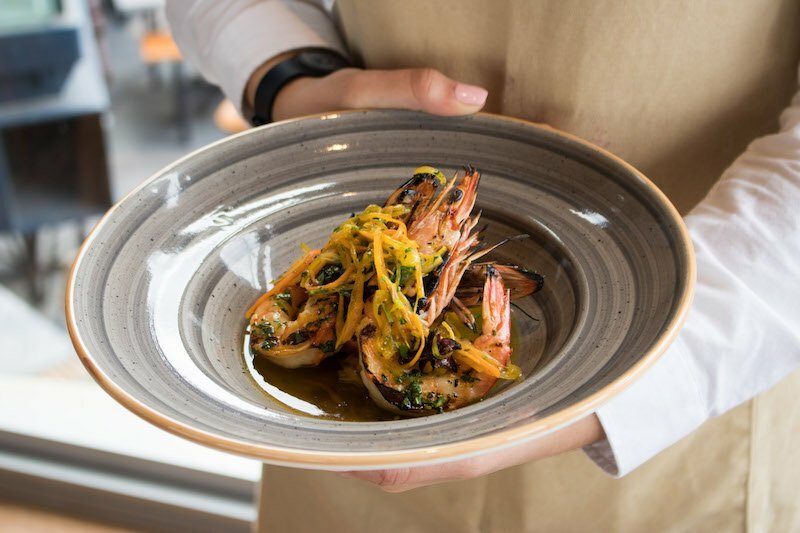 From the land and sea, options include a handmade gnocchi ($33) with mushroom and goats cheese, or a clam and prawn linguine ($36) complete with chilli, garlic and chardonnay. How un-publican indeed. Unite your mains with the assorted tomatoes and labneh ($12), a light side share. Twisting classic desserts, The Squire’s Landing’s sweet selection is droolworthy. Loosen your belts for the banoffee pie ($18). Pouring out for a terrarium jar, be sure to mix the smooth and creamy combination of banana, coer a la creme, caramel and a cinnamon crumble. A highlight of the night. Amply fed, return to the bar for a pint, take in the view of the time-honoured surrounds or stumble down to the Brewhouse for a quintessential pub affair. The Squire’s Landing restaurant has set its course on redefining expectations. For diners the venture is both unexpected and enjoyable. The Squire’s Landing. Open: Monday – Thursday 10am-12am, Friday 10am-1am, Saturday 8am-1am, Sunday 8am-12am.